©2014 The Pink Macaroon. All rights reserved. Empanadas are a very popular dish in Latin America. In Spain we call them Empanadillas. 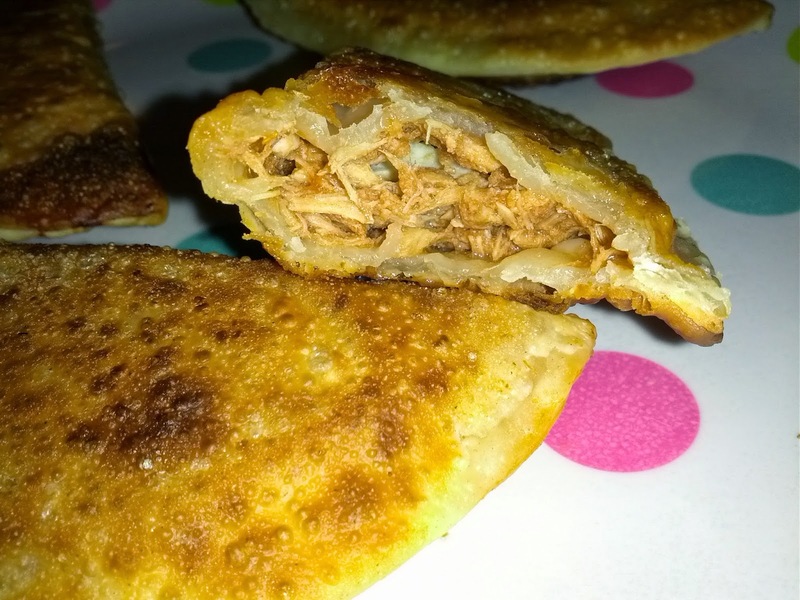 The most famous ones are Empanadillas filled with tuna and egg, however they can be prepared with other ingredients, depending on the family's taste. Our favorite ones are empanadillas de atun y huevo. The package has 12 individual dough pastry. I prepare them all, however I only fry four of them, and the rest to the freezer. Four is plenty to eat for one person because they are very filling, and let's don't forget fattening because it is deep fried. The term that we use in Spain for the dough is "obleas de empanadillas" however in the package it says "Tapas de Empanadas", and that's the term that I am using in the ingredients list. The packaging is from Mexico, and if this is something that you want to try, "Tapas de Empanadas" is what you will look for in any of the Latin Stores. I take the dough out of the freezer in the morning, and I put it in the fridge to defrost. The dough needs to be pliable, and not frozen. I boil the egg for 10 minutes, in a pot with water. After the egg is done. Peel and chop into small pieces. Let it cool. I open the tuna can. I toss the water and/or olive oil found inside the can. I put the tuna in a bowl, and I mince it. I add the egg, half of the tomato sauce, sugar and salt mixing the ingredients together. I put more tomato sauce if the mixture it is too dry. I add the rest of the tomato sauce, being careful not to make it too runny. Open the package of dough. Each sheet of dough is separated by a film of plastic. I use that plastic to separate them. I put them in a flat surface. I fill the middle of the dough with the mixture. I fold them in half, and with the help of a fork I close them by pressing all around the edges with the teeth of the fork. I add the 1/2 cup of olive oil to the frying pan. I turn the stove to a medium-high heat. When the olive oil is hot (not smoking, that's too hot). I put the 4 empanadillas. I turn the empanadillas around when he frying side is golden. I do the same for the other side. Once both sides are golden, I take them out to a plate with paper towels. The paper towels will absorb the extra oil. I let them cool off for a little bit, and then…they are ready to eat. ©2013-2014 The Pink Macaroon. All rights reserved.. Watermark theme. Powered by Blogger.